1. When encountering various creatures in the wasteland, some of them like radroaches and molerats will show subtitles saying "Aha!" or "Hey!" but thankfully they don't actually say those words. I also ran into a brahmin who had the subtitle "Hello" but again didn't actually say anything. Did I do something wrong in my installation to get this behavior? 2. I noticed that in my compass I don't get any of the empty triangle arrows that would normally show whenever I am in range of an undiscovered location based on my Perception. It is only when I discover the location that I finally get a filled triangle arrow. Did I screw up the installation or is this intentional? Is this something I can adjust in the ini files? I already found and fixed this bug a couple weeks back, it will be in the next update (3.2.3). Undiscovered locations is default feature of Vanilla UI Plus. Have no idea why he turned locations off by default. Yeah I meant the random hellos/goodbyes and stuff. 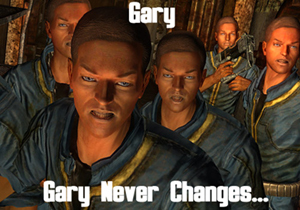 This is actually a bug in NV itself for a change. Thanks for the reply! One other issue I forgot to mention is that I can hear gun and laser sounds from a distance as though they are coming from right next to me. When I get closer they suddenly fade away and then get louder again as I get close to the enemy firing his weapon. Is this something I can adjust via ini files or can I use the Distance Gunfire Sound Fix? It's an engine bug, it's supposed to blend the 3d and 3ddist sounds. The fix is not compatible sorry.